A quick search that executes whatever query is currently displayed in the search text box (located at the top right). You can enter a keyword in the search field and a list of items is automatically displayed. In addition, the drop-down arrow at the left of the search text box allows you to select which type of items to search for. You can select to search within messages and your contacts, including company contact lists, appointments and files. An advanced search makes it easy to execute more complex searches. This feature is accessed by clicking on the magnifying glass in the Search field. The advanced search pane will appear on the left. You can group your search results. In addition, the convenient organizing features — Folders, Tags and Flags — enable you to quickly label, locate and retrieve messages. We have included step-by-step instructions below on tackling these organizing features. Please see Most Common Organizing Features listed directly to the right. Click on a feature description (e.g., Using Flags) and it will allow you to jump to specific instructions below. Then, click the browser back button to return to the top of the page. Step 3. 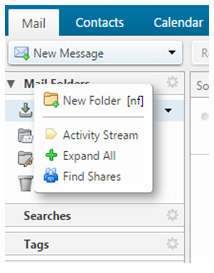 Enter the new folder Name and select a folder Color. Folder names can include any character except a colon (:), forward slash (/), and quotation mark ("). Please note: You can rename and delete user-defined folders. System-defined folders cannot be renamed or deleted. You can use word tags to help classify and organize your email messages, conversations, calendar items, contacts, briefcase, or tasks. For example, you can type a tag for Immediate Turnaround and another for Medium Priority. You can type a particular tag for tasks or add project tags to sort email, and you can search for all items with a specific tag. You can also apply multiple tags to an item. Step 2. 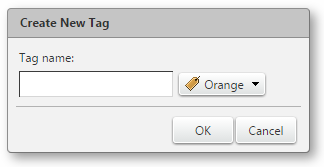 Type the new Tag name and select a Color for the tag. Tag names can include any character except a colon (:), forward slash (/), and quotation mark ("). Step 3. Click OK. The new tag is listed under Tags. Step 2.This will display all tags with this name. If the tag name is two words, you must use quotes around the name (tag: "tag name"). Please note: After you create a tag, you can apply it to an item. You can assign more than one tag to an item to classify it under different categories. If an item has multiple tags, the tag icon is multicolored. Only tags that are not already applied to the item are listed. In addition, you can also remove a tag from an item (), delete a tag, rename a tag, and change the color of a tag. The flag icon in the message list is a yes/no indicator that denotes whether the email message has been flagged. This can be used to indicate an action needed item or to distinguish the message or conversation from other items of lesser importance. Step 2. You can also right-click to "unflag" the item. The flag is disabled and the flag color turns to a grayscale color.